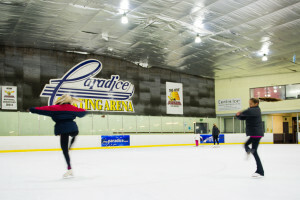 Paradice Skate School classes are designed for beginner to advanced skaters from the ages of 4 years up – you’re never too old to start. Our most mature beginner started at the age of 65. – Self Confidence – Social interaction – Technical skills. 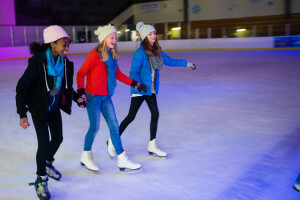 Progressing through our classes can branch into 3 different Ice Sports at either a recreational or competitive level: Speed Skating, Ice Hockey, Figure Skating (Singles/Pairs/Dance/Synchro). Class time is 60 minutes, for the “Children and All Ages: classes there will be a group warm up involving all the skaters. This is necessary to increase blood flow to muscles to prevent injuries. Instruction on skills is from the National Skate School Syllabus called “Kiwi Skate”. The last portion of the class is dedicated to fun games and activities. Maximum number of skaters to each coach is 15. Click here to see what the levels of skate school are. Held during each school term; At Avondale every Tuesday, 5-6.30 pm; And at Botany Downs every Tuesday 5pm-6.30pm and Thursday from 3.45pm-5.30pm. We recommend these sessions to practice skills learned from lessons. 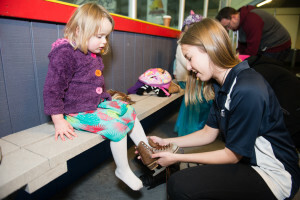 Discounted cost to current skate school students = $9 for all ages including skate hire. Usual admission rate is $15 for Children 12yrs & Under, and $19.00 for Adults 13yrs+. Your friends and family can skate with you on this session, as it is open to the public at the normal admission and skate hire rate. If a skater misses a lesson due to sickness or injury, they can make a lesson up on another class day during the same term. All lessons need to be made up before the end of term as credits do not carry over to the next term. Class fees are non-refundable and non-transferable. It is ideal to bring along gloves or mittens, long pants, thick socks and sweatshirt/jumper. Some like to wear a light jacket, but in general, active wear clothing with a little stretch is suitable. 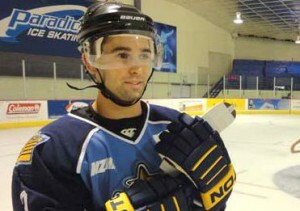 Skate hire is included in course fees. Sizes range from Toddlers children’s size 10 up to men’s size 14. When skaters have their own skates they usually find it easier to progress, and coaches can see a marked improvement. Skater should be able to wiggle toes, yet there should be no slipping of the foot within the Skate. Skates should be laced snug and comfortable right to the top of boot. The skate should be tied fairly firmly from the toes to the hooks, and from the hooks to the top. Laces should not be pulled so tight that circulation is being effected. There should be enough flexibility in the boot to feel comfortable when knees are bent.